Adobe Flash CS5 is one of the most popular interactive multimedia development tools on the market, providing design professionals with the ability to create engaging experiences, ranging from instructional media and games to entire web sites. 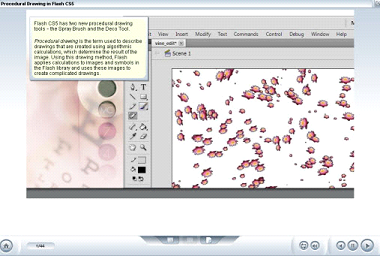 Our training tutorials for CS5 includes an overview of the updated interface as well as working with sound and video. In addition, you will gain a grasp of ActionScript, which is essential to create an interactive user experiences. In addition, you will learn to use the drawing tools, give 2D objects a 3D appearance, and how to import, manipulate, and optimize graphics. This course demonstrates step-by-step, how to get started in Flash Professional CS5, providing a comprehensive introduction to the updated Flash environment. It introduces the learner to methods of creating graphics, explains how to plan Flash projects, and demonstrates how to use the core interface areas such as the stage, timeline, and layers. Our Adobe Flash CS5 training course takes you step by step from the beginner level to the advance level.